The 10 Best Guided Tours in Arkansas! Feeling adventurous? Get to know Arkansas a little better with the help from a tour guide. Whether you’re looking to explore the Natural State’s historic landmarks, get spooked on a ghost walk, or take in the beauty of a vineyard, you can do it all with the expertise of a guide. Here are our picks for the best guided tours in Arkansas. Hop aboard the famous “Little Rock and Roll” bus for the tour that everyone is talking about! The Little Rock Sightseeing Tour, at just $25 per person, is perfect for large groups. On this tour, you will learn about historical Central Arkansas events that captured worldwide attention. As far as guided tours in Arkansas go, a tour of America’s most haunted hotel is a must. Come see this world-famous hotel where some guests checked out but never left! You’ll hear frightening ghost stories about Michael, Theodora, and much more on a guided tour of this haunted hotel in Eureka Springs. Crystal Bridges Museum of American art offers several guided tour options, including school tours and one-hour drop-in tours. If you’d rather explore on your own, but still have a guide, then you can download the free app on your Android or Apple device and let the Crystal Bridges audio tour guide you through the beautiful galleries. Come catch a rainbow on a Cotter Trout guided fishing tour, established in 1954. This guided tour is all about fun and relaxation! No experience is required as you drift down the White River, North Fork River, or the Buffalo River in north-central Arkansas. During this guided tour, you’ll be able to fish while you watch the wildlife and take in the beautiful Arkansas scenery. Miss Laura’s is the only house of ill-repute listed on the National Register of Historic Places. Many folks have enjoyed a tour of this brothel that used to be in the spotlight of what used to be Fort Smith’s Old West red light district. Don’t worry your reputation won’t be tarnished by going on a guided tour of this historic site! Come take a tour of one of Arkansas’ most beautiful natural attractions and the largest privately owned show cave. Cosmic Cavern in Berryville is located halfway between historic Eureka Springs and Branson, Missouri. This cave was discovered back in 1845 but wasn’t developed until 1927. Cosmic Cavern features a nine-foot soda straw, the largest known in the Ozarks, and two bottomless cave lakes. Take a step back in time and experience the people of the Bible firsthand on this well-known tour in historic Eureka Springs. The Holy Land Tour offers a unique opportunity to witness the ancient Middle-Eastern culture in which Jesus was raised. Folks from all over the world have traveled to Eureka Springs just for this experience! It’s all about the wine on this popular tour of Arkansas’ Post Familie Vineyard. Their new wine store and visitor center are open for tours and tastings! If you’re feeling a little light-headed at the end of your tour, overnight lodging is available. There is plenty of fun to go around on a Hot Springs group tour. Hot Springs offers an online Group Tour Planner as well as a Reunion Planner to help you with the planning process. 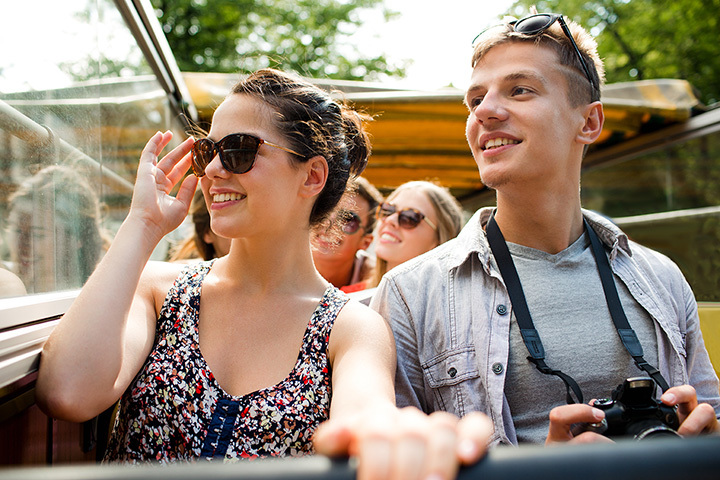 Some of the most popular sites for group tours include: The Gangster Museum of America, the National Park Duck Tours, and the Mid-America Science Museum. Are you looking for the inside scoop on the Little Rock Zoo? Then you definitely need to take a guided tour! You can join zoo educators every Saturday at 11:30 a.m. and 1:30 p.m. for an in-depth look at what makes the animals here so unique. Tours are limited to 20 people so get there early!